Would have no hesitation in recommending Rochelle at Fluoresce Bookkeepers, she is always on time with getting my books done, picks them up and delivers them back, all done with a smile and a can-do attitude. I first began using Fluoresce bookkeepers in June 2018 after my long time Bookkeeper of 32 years retired. As you can imagine after 32 years I was fairly anxious about the transition. She made the transition for me very easy and stress free.I am extremely happy with Rochelle’s service. I would easily, happily recommend her to other businesses. Rochelle has been our book-keeper for the past couple of years. She is professional, knowledgeable and her attention to detail is impressive. I can always rely on Rochelle to follow up and find solutions for account payable and receivable queries. I would definitely recommend Rochelle as a first class book-keeper. I would like to thank Rochelle at Fluoresce Bookkeepers for her professional, friendly and prompt service when The Hearing Clinic was in the early stages of development. Her level of expertise and lovely nature made it easy to get jobs completed and become more organised. Fluoresce Bookkeepers have provided reliable, thorough bookkeeping services to Blair Podiatry trading as Carousel Podiatry and Cambridge Podiatry for the past 6 years. Rochelle is a trusted member of our Business team and we highly recommend her services to other clients/businesses. Rochelle worked with Madalah Limited for over 3 years, providing a book keeping service. She was part of the team and was very reliable. She would often go above and beyond to support us, especially during our reporting period to Government. Aside from her reliability, she is both professional and focused. Our organisation had gone through a period of transition and her support during this time was extremely valuable. If you are after a person that is interested in your business and makes an effort to understand what you do, you should get in touch with her NOW!! I have been acquainted with Rochelle Spencer since January 2010 in her capacity as bookkeeper with Fluoresce Bookkeepers. Rochelle was exceedingly functional and professional as the bookkeeper of my both my companies. She was able to problem solve and work well independently. She always responded to requests from management or staff in a timely manner and was adept at prioritising multiple ongoing projects. In sum, I am pleased to be able to provide this testimonial for Rochelle Spencer and her bookkeeping services. When writing testimonials, it is an all too rare experience to be able to freely praise and recommend the services while preserving one’s credibitliy. It would be an advantage to any organization to have the services of Fluoresce Bookkeepers. Rochelle at Fluoresce Bookkeepers has been an amazing support for us in the first year of our business. Not only has she helped with the accounts setup and ongoing reporting for the business, the bookkeeping training and mentoring Rochelle has provided has made starting and growing our business a thousand times easier… we couldn’t have done it without her! She is friendly, professional, extremely reliable and her attention to detail is second to none. 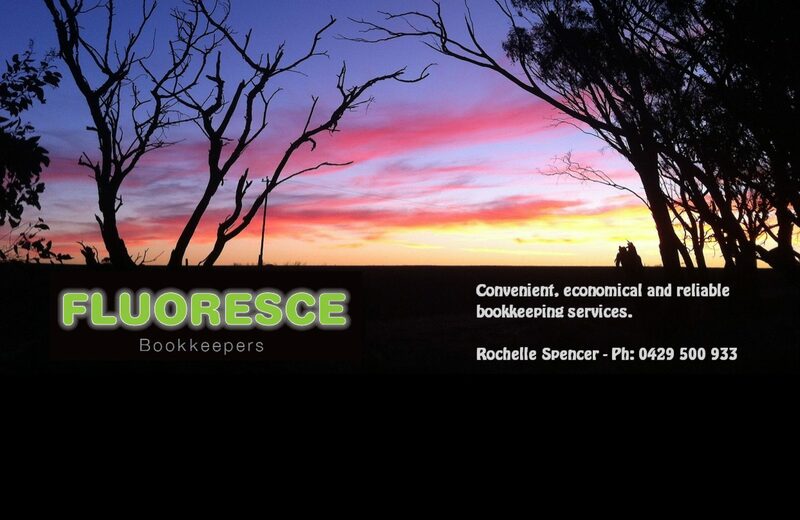 We highly recommend Fluoresce Bookkeepers’ services and we thank Rochelle for supporting our business needs. Rochelle from Fluoresce came to my rescue after a few months into life as a sole trader, when it had become pretty clear I had made a mistake thinking I could manage my books personally. Rochelle reviewed my situation, tidied up the mess I’d made on my free online accountancy platform (Wave), before transferring everything over to a new, gst-compatible platform (Quickbooks) that she helped me select. It’s made a massive difference to my business knowing that every quarter Rochelle will contact me, review everything, request any invoices or receipts needed and just generally make sure everything is in order before preparing and submitting my BAS on my behalf. She even offers to chase up overdue invoices by phone or email, which is never a fun job for a sole trader who relies on maintaining client relationships for repeat work (with Fluoresce taking care of it, if feels like it separates you from the money side of things). What I love most is that I have complete trust in Rochelle, so I don’t have to worry any more. It’s a small price to pay for peace of mind knowing the business is ticking along in the background, so I can focus on work (or use my time off with the family). Rochelle is very easy to deal with, very real and friendly, and you just know she cares about doing the right thing by you. She doesn’t miss a beat, is very efficient and proactive, and will chase up anything needed to ensure we hit any timelines. I’d recommend Fluoresce in a heartbeat.